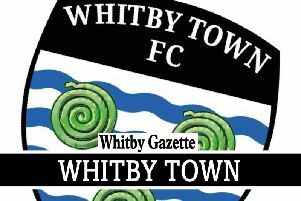 Whitby Town boss Chris Hardy has expressed his delight after extending the loan deals of defender Kev Burgess and goalkeeper Ryan Whitley. The Blues ended their 16-game streak of games without a win when they travelled to third-place Workington on New Year’s Day and picked up a shock 3-1 victory courtesy of goals from Junior Mondal, Lewis Maloney and debutant James Fairley. Boss Hardy then moved to extend the deals for both York City custodian Whitley and Darlington defender Burgess. And the manager is delighted to have secured their services for the longer term. “It’s great that we have managed to secure the services of Ryan and Kev,” said boss Hardy. “Kev is exactly what we needed in our defence. "He has that extra bit of experience on our other defenders and he’s a leader - which is also massive for us too. “From the point-of-view of young Ryan, it’s a move that will benefit us, himself and York City too. “He’s not banging on the door for first-team football with York so we can offer him something here that he wouldn’t get there. Hardy is still looking to strengthen his ranks. “We’re always looking at ways we can improve our squad going forward,” added Hardy.